GlassVoice.apk was full of goodies last time. It revealed voice commands for lots of things, from "Capture a Panorama" to "Play a Game" to "Record a Recipe." It was our speculation that these commands were serving as hooks for third-party glassware to latch onto, putting their functionality in the "ok glass" list in much the same manner as apps like Evernote already do. In XE11, GlassVoice has a few more things to show us. In addition to all the commands we saw last time, GlassVoice has commands for "find a place," "explore nearby," and "start a workout." We could assume that the place-related commands are either tied to Google Search or a third party app, while "Start a workout" seems to fit in with the biking, running, and golfing commands we saw last time. There's also some evidence of progress on the "tune an instrument" command, with new pitch-related smali files. Besides the new commands, the XE11 update also conceals some new iconography, giving us some small imagery related to the presumably upcoming abilities. We can't infer much more than we already have about these functions based on the icons alone, but it's good to see progress is still being made on making them a reality. Thanks Rajesh Handa for the tip! The Glass Boutique, which would offer a portal for Glass owners to purchase and install glassware, has been in the works for a while. Some speculated that it would come with XE10, but other than Google's addition of a "Glassware" section to the online MyGlass interface, there's been nary a peep about the store. Inside XE11 though, there's a GlassBoutique APK file, meaning the store could be getting close. Unfortunately, the apk file doesn't offer anything in the way of visuals or other UI elements (yet), but we do have some interesting strings to look at, mainly related to installing or "activating" Glassware. It is possible that the process of installing things from the Boutique will look much like the interface of the current MyGlass offering, whereby users simply turn apps on or off using a single button. For now, further information about the Boutique is still sparse, but we can hope to see more in XE12. Of course, Play Music on Glass is another point of interest. Last time, we saw code for a music card layout, and speculated that perhaps Glass would be able to control Play Music on other devices remotely. Josh Brown's GlassTunes app makes use of the music goodies found in previous Glass builds to allow for local playback, pulling from your Play Music library. XE11, however, contains a GlassMusicPlayer apk which in turn contains some very telling strings. Here's the full list of relevant tidbits. If this is anything to go by, we can see that Glass Music will work much as we've expected - the Listen To command will trigger a voice search for artists, playlists, albums or individual songs. You'll be able to start a Radio station based on these factors, and start playback "on another device," presumably controlling that playback from Glass. It looks like Glass will even be able to deauthorize devices, which you'll have to do if you've got ten devices already authorized on your account. Again, much of this functionality we already knew about (or experienced using GlassTunes), but it's good to see confirmation of remote control, and that these functions are coagulating into an apk. That's it for this teardown. 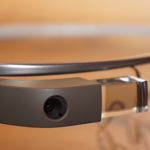 Glass is inching closer to new and amazing functionality. While much of what we've discussed is probably still a few updates away, it's exciting to make at least partially educated speculations on Glass' future capabilities. Of course, if there are more goodies to find before XE12 rolls out, we'll find and report on them.